Mai Houa Xiong is a guest writer. She is an Individualized Studies major. Above busy Washington Avenue in Minneapolis the digital marquee at Open Book read: “Metro State University ‘Haute Dish’ Saturday 7 p.m.” Metro State’s arts and literary magazine was in the bright lights and big leagues at its annual spring reading on Saturday, March 24. Metro State students, faculty, alumni and family members gathered at the Target Performance Hall on the second floor of Open Book. 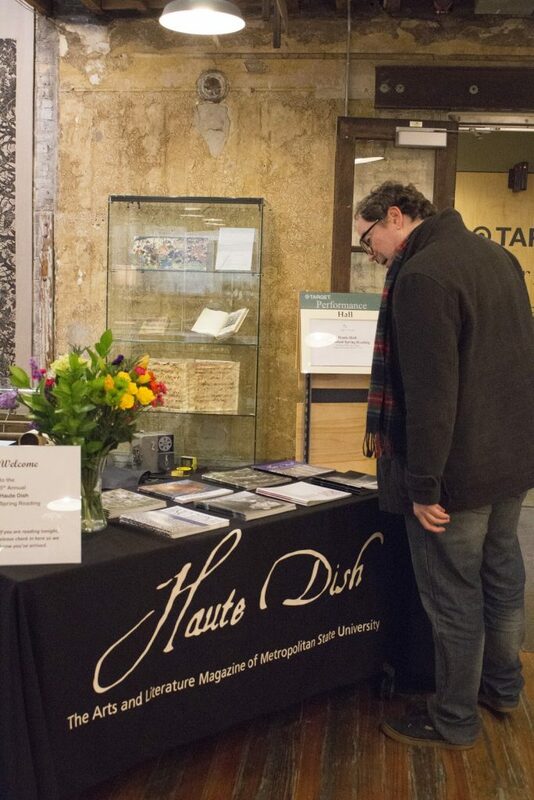 Before the reading began, they perused printed issues of Haute Dish from the last six years. Alumnus Whittier Strong appeared deep in nostalgia as he picked up several past issues and flipped through the pages. He said he had just returned from Alaska where he was pursuing graduate studies in literature and creative writing. He was eager to read a few pieces that were published while he was an undergraduate. Some were so old that only electronic versions were available, he said. 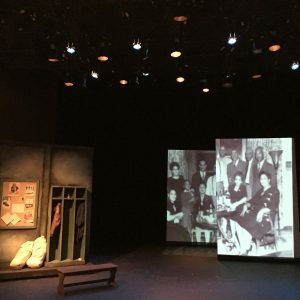 Metro State alumnus Whittier Strong looks at past issues of Haute Dish outside the Target Performance Hall at Open Book in Minneapolis on Saturday, March 24, 2018. 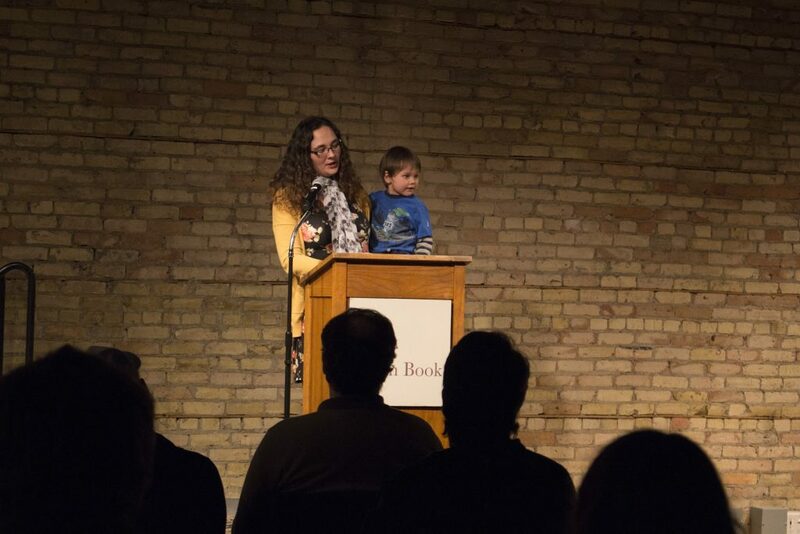 Haute Dish has held its spring reading at Open Book for the last five years. 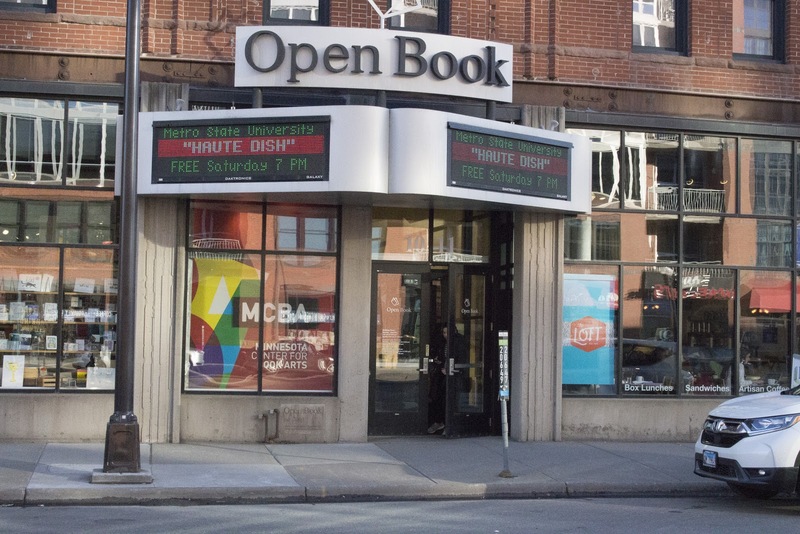 Open Book is a nationally known venue for literary arts. It houses The Loft Literary Center, Milkweed Editions and the Minnesota Center for Book Arts. Haute Dish was founded in the mid-1990s. It operated for five years until it took a hiatus due to budget cuts. Haute Dish resumed publication as an e-zine in 2004. With funding from student fees, Haute Dish has published online and in print every fall and spring semester since 2010. The glossy magazine is distributed throughout Metro State’s campuses and at a few community locations like Open Book. Haute Dish welcomes submissions from students, faculty, staff and alumni. The magazine publishes works of visual arts (illustration, painting, sculpture and mixed media), poetry, fiction, personal essay/memoir, creative nonfiction and digital storytelling. Rodessa Padua, Haute Dish’s managing editor, emceed the event. She welcomed each literary artist as they took the stage and shared pieces that came from their hearts. The audience of 45 people applauded, laughed and cried—sometimes all at once. 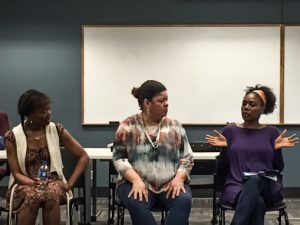 Creative writing alumna Jamie Haddox reads from her work published in Haute Dish on Saturday, March 24, 2018. “The publication reflects the diversity of Metro State,” said Jonathan Hiatt, a contributing author and former managing editor. He said his work on Haute Dish has made him feel more connected to his university. “An added bonus is that I acquire and put to use the skill set that employers are demanding of English and liberal arts majors,” said Hiatt. The spring 2018 issue of Haute Dish will be released in mid-April. Past editions can be accessed at hautedish.metrostate.edu. 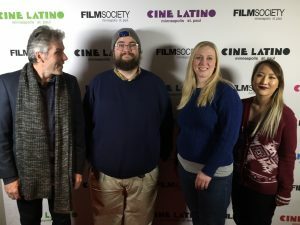 The deadline for fall 2018 entries is April 15. Submission guidelines are available at hautedish.submittable.com/submit.